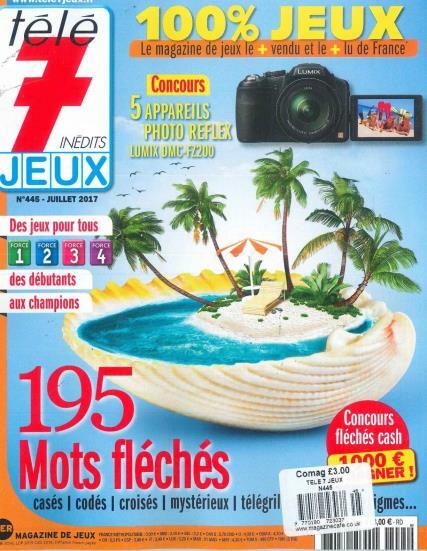 The Tele 7 Jeux is a French magazine that has taken the world by the storm and has been a stable friend to those that believe in the concept of an activity based magazine. Translated in English as TV 7 Games, this publication highly activity based and requires much concentration and interest from the reader to enable him to have a good time when reading it. Tele 7 Jeux has a format in which children and adults can both access the wonders of fun games and power grids of various degrees. The difficulty levels differ according to age and experience and this allows kids as well as parents to spend their time in much needed relaxation. This publication harbors games in the forms of crossword puzzles, puzzles, boxes, Sudoku, logic games and various kinds of psychological testing games that have created uproar in the entire west. This family magazine tries to all with its classy as well as colorful designing. The instruction to each puzzle has been clearly laid out and this helps the reader to understand the rules of the game and further play by them. There are competitions for the whole family and the brilliant design sets up an ambience for a healthy competitive spirit and pace. Providing an adrenalin rush to most members of the family, the Tele 7 Jeux is offered monthly and this is one of the reasons that make it so interactive and fun.